Recently, I met with a new client, and the first thing he asked me was what I thought of his website? I told him it was stunning…because it is. Know your audience when it comes to web design. Here are several other tips you should know before creating or redesigning your site. Know your audience. 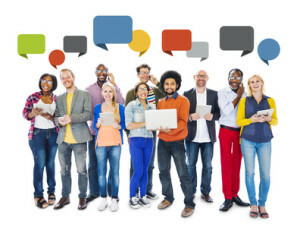 You must know who your target market is and if you plan to increase engagement with a particular demographic, you must design to their ideals, colors, and use. Not yours. Know about vision deficiency. I often work with clients who have a certain color combination in mind and an idea of what they want the site to look like. We respond with mocks and ideas. I also always stress the importance of running site designs through a vision deficiency checker. This helps you to see how people with color-vision deficiency—eight percent of all males—might experience your site. It’s also helpful when it comes to readability. Here are a few to consider. Colblindor: This free CVD simulator allows you to upload sample images from the site to check for red-blind, green-blind, blue-blind, red-weak, green-weak, and blue-week tendencies. Color Oracle: This site applies a full-screen color filter to art you’re designing. Know that once built, you should submit your site for indexing. In order to gain access to search engines, it’s always good practice to submit a site upon launch to the search engines for indexing. Without this step, your site to the will of crowds to get noticed. By submitting a site, you are securing your site review in the search engine queue. How do you do it? 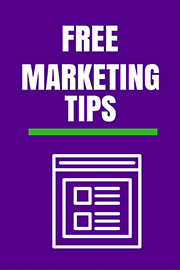 Use a site submit page like Google, Bing, and Yahoo! There are dozens more, but if you know your audience, you will know which engines they use. Plus, once indexed by the major engines, the others will fall into place. Know about design and structure. Themes and templates make things easy when it comes design concepts. You don’t have to think about what goes where and really how it’s going to look. That’s the good thing. The bad thing is making sure you understand the image dimensions and functionality of the site when adding specific elements, like social media icons, image placement on blog articles, and more. Know about alt tags. Yes, everything you place on a website has the ability to increase search engine optimization, including images. 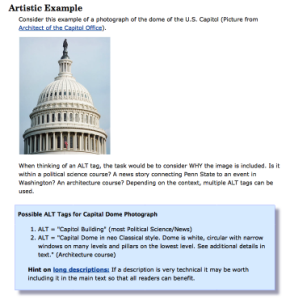 Leveraging alt tags on images helps to tag the image to a specific keywords. For example, the image at the right demonstrates the use of a short alt tag and long description alt tag for the capitol building. Know about tags and keywords. Every page on a site, including blog content, news items, pages, etc. should have keywords or tags associated with it. This identifies the content on the site to search engines. Do not stuff a bunch of keywords on a page. Use a strategic approach to each page and the content on it to reflect the correct, limited number of keywords per page. Know about 301 redirects. This is especially important when redesigning a site, or launching a new site with another host. This provides past visitors who may have book marked a page to redirect to the new page without much hassle. Here are some tips from Moz about 301 redirects and the different kinds there are. View the “Website Design 101 What You Should Know” slide deck, video, or infographic. Remember to share!